Recently I was given the opportunity to check out an upcoming new game that will be available on Kickstarter very soon. I received a prototype of the game with everything needed to play. These are my thoughts and opinions on the presented materials. Enjoy! 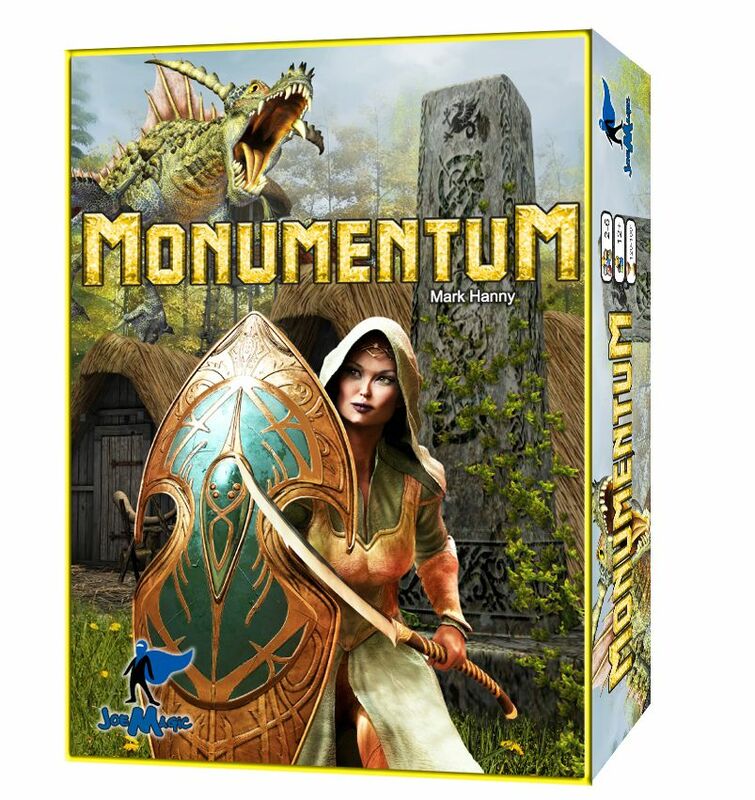 Monumentum is a game by Mark Hanny, published by Joe Magic Games. It is for 2-5 players. In this game, players take on the role of fantasy characters such as Rangers, Mages and Soldiers as they try to prove their mettle by performing 3 Honor tasks. They will be roaming the country side for the resources needed to build grand monuments, while battling fierce monsters of all shapes and sizes. They’ll have to plan wisely and utilize the training of the monks if they hope to be successful in their endeavors. In the end, the player that can perform 3 Honor tasks first or gain the most victory points by the end of the game, will be declared the winner. To begin, the boards are placed together in the middle of the play area. Each player chooses a color and a character card. The player then takes the corresponding standee, as well as all the matching player tokens and monument tokens in their chosen color. They are also given 10 health tokens and 12 different action tiles. The mission cards are shuffled together and placed face down in a stack. Each player is then dealt 3 random mission cards which are placed face down in front of them. The power cards are shuffled together and placed face down near the board in a stack. The top 5 cards are then placed face up in a row near the board. Three random attribute tokens are placed on the 3 monk spaces on the board. The monster standees are placed on the corresponding spaces with their pictures on the board. The first player is chosen and is given the first player marker. 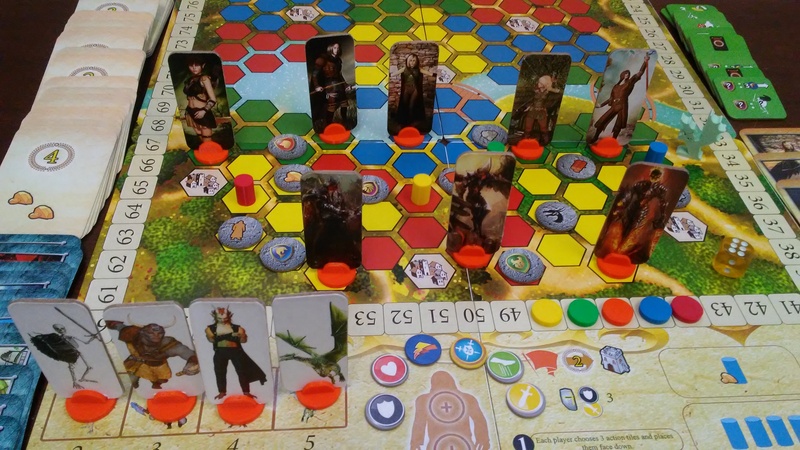 All of the action tokens are placed face down on the corresponding colored hexes on the board in a random fashion. Each player will now place their character standee on one of the village spaces on the board, beginning with the player to the right of the first player and continuing in counterclockwise order. Once all players have placed their standee, each player will turn 3 action tokens face up on the board, starting with the first player. The tokens that a player flips must all be on the same color hexes but in 3 separate regions. If a monster token is revealed in this way, the token is removed and a monster standee is placed on the hex. More on this in a bit. Once all of these steps have been completed, play now begins. The game is played in a series of turns. Each turn consists of 3 steps. In the first step, each player will choose 3 of their action tiles and place them face down in front of themself. These tiles will then determine what actions the player will take in the next step. In the second step, players will take turns revealing one of their chosen tiles and then performing the action depicted on the tile. This is done in turn order starting with the first player. The player has the option of performing one or both of the actions on their action tile. It should be noted that if a player’s standee is next to a monster, they may perform combat with the monster before taking any other actions. There are a number of different actions that the tiles can provide. At this point, I’ll give a brief overview of those options. One thing that can be done is for the player to move their standee a number of spaces equal to their movement ability. This can be increased with foot attribute tokens and/or energy tokens. The player can turn over 3 face down action tokens that are on the same color hexes in 3 separate regions. In some cases, this may reveal a monster which is replaced with a monster standee, more on monster combat in a bit. The player can pick up a token on the same hex as their character’s standee. They can complete a mission, gaining a number of victory points, as long as they have the correct requirements and all requirements to complete the mission are met. Once a mission is completed, the card is discarded and the player draws a new one to replace it. If the player’s standee is in a village, they can buy a spell card by paying the matching shield or resource cost. It should be noted that players are only ever able to have 3 active spells at a time. Once a spell is bought, a new spell is drawn to replace it with. Speaking of spells, using a spell does not require an action to cast. However it does cost one energy. Earlier I mentioned monster combat when a player’s standee is adjacent to a monster. To attack a monster, the player rolls the combat die. They must roll equal or less than their attack number to hit the monster. That number can be increased by spending energy tokens. A hit forces the monster to roll their shield ability. A roll of equal or less than their shield number prevents damage. An unblocked hit scored on a monster will kill it. The player then gains victory points as shown on the monster board. It should be noted that if a player begins their action phase adjacent to a monster, then the monster attacks them instead. Combat in this case is pretty much the same way, just with the monster being the attacker and the player the defender. A hit from a monster does damage equal to the number on the monster board that matches that monster. The player then loses health tokens. If all a player’s health tokens are gone, then they can only move, pick up tokens and heal. They must also discard one spell card and lose control of any monsters under their control. A combat victory over a monster also gains the player a valor token which lowers monster shield points in future fights by 1. Players can also attack each other, much in the same way as other types of combat. Damage inflicted by another player is equal to their attack ability and the defending player loses health tokens equal to this number. If a player defeats another player, they can then take their choice of a spell card, two resources, two shield tokens or a flag from the loser. Other actions that can be taken are paying a shield to gain 3 energy. The player can build a monument by paying two identical resources and placing it on an adjacent hex that is empty of any other game pieces. One of the resource tokens is placed beneath the monument to show what it’s made of. Players gain bonus points at the end of the game for stone or gold built monuments. A player completes an honor task by either building a monument of gold or building their fourth monument. Players can also control monsters by paying a shield and placing a player token on the monster board of a matching monster that is already on the board. Players can move their controlled monster adjacent to another player’s standee forcing the player to resolve combat before taking any other actions. A player can learn an increased skill by being on a hex with a monk token on it. 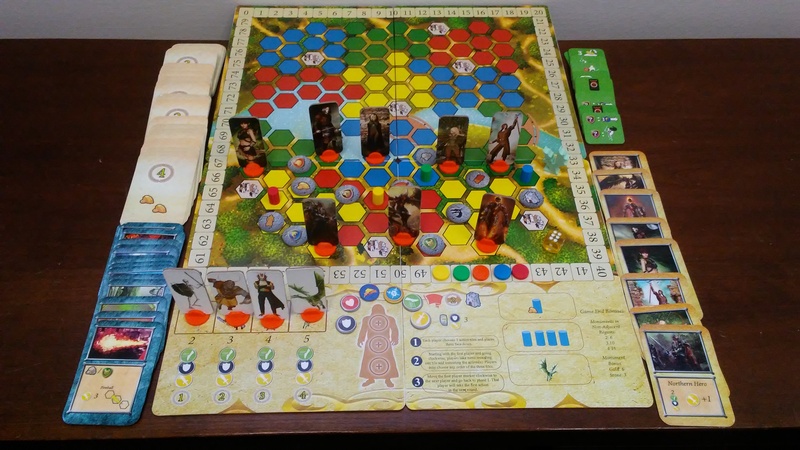 The player can then choose to take an attribute token from the monk at the bottom of the board. A new random attribute token is then placed on the monk space. The monk token is then placed face down on a blank hex of the same color in a different region. The player can also plant a flag on a castle. However before placing the flag, the player is attacked by the knight that defends the castle. The knight attacks just like a monster with a 3 for all of it’s attributes. After damage is calculated or prevented, the flag is planted and the player gains 2 points. The player also has the ability to repeat one or both actions on one of their previously used tiles. If the player is running low on health, they can use the action that allows them to spend a shield to gain 3 health tokens. Finally the player can take a mission card and trade it for the top card of the mission card draw pile, discarding their old card. One more thing of note, each player’s character has a special ability that will help them in various ways. For instance, the Northern Hero begins with an attack level of 3, while the Elvish Archer can attack from one hex away from the target. When and how to use these abilities is up to the player. Once all players have revealed and resolved all 3 of their action tiles, play moves to the final step. The final step is simply to move the first player marker to the next player in turn order and begin a new round. The player with the first player marker now becomes the first player for the new round. The game continues until either a player completes 3 honor tasks or all of the action tokens on the board have been turned face up. The 3 honor tasks are to build a monument of gold, build 4 monuments and defeat the dragon in combat. If a player does these 3 things, they are the winner. If all the action tokens have been turned face up, then end of game scoring occurs. Players are awarded extra points for each gold monument or stone monument they built. They can also gain points for having either 2, 3 or 4 monuments in adjacent regions. Players add up their points and the one with the most points is the winner. Like with most Joe Magic Games products, there are lots of really unique and interesting looking components inside the box. In this case, a lot of pieces are cardboard. The board is one of these cardboard pieces. It came in 4 separate pieces that had to be laid side by side to assemble the map. I kind of wish that this had been 1 folded piece instead of 4 boards. As it is, it’s easy to bump a board and mess up pieces laying on 2 boards. As for the look of it on the table, I’ll admit when I first looked at it, I thought it was a bit too colorful and didn’t really have a fantasy vibe to it. Once you start playing the game however, it’s not such a big deal. Plus it makes sense as the colors are actually part of the gameplay. Next you have a whole bunch of cardboard tokens, 4 bags worth to be exact. Two bags of larger action tokens and 2 bags of smaller attribute tokens. The action tokens have a dark blue back and a gray stone like background on the front with the action icon on top. These I actually like a good bit. It’s pretty easy to figure out what each one is or stands for. The attribute tokens, while not too small are double sided with the same image on both sides. With many of these, the token was miscut leaving the image off center and looking rather bad with large slices of gray on the edge. It’s a bit sloppy and definitely needs some work. The action tiles are also cardboard. Like the action tokens, they too have a dark blue back. The front side of these is bright green with the action icons on the front. These are bigger than the action tokens and are completely square. In the box there are 5 bags worth of tiles, enough for up to 5 players to be able to play with. The final cardboard pieces are the monster and character standees. These are long pieces that are double sided with the monster or character on both sides. I really like the artwork that was used on these. It kind of reminds me of the artwork from Madstone Chronicles. The game also comes with some plastic pieces. There’s a bag full of bright orange standees to place the monster and character standees in. I really wish these had been clear instead of orange. The orange really pulls you out of the theme and looks quite garish on the board. The other bag of plastic consists of the first player marker, monument markers and player markers. The monuments and player markers come in 5 colors; orange, green, red, blue and yellow. At first I thought these were wooden, but on closer inspection I realized they were plastic. The first player marker is a light green dragon meeple that’s pretty cool looking, while the monuments are small cylinders and the player markers round discs. The game also came with a clear yellow combat die and a fairly good sized stack of cards. There are 3 types of cards; mission cards, power cards and character cards. Much like the cards in other Joe Magic games, they have a plastic look and feel to them. The artwork on the character cards and power cards is quite nice, much like the art on the standees, while the the mission cards have different icons on them that must be accomplished. I will say that though I like the look and feel of the cards, like the attribute tokens, the cutter must have been askew. Each one leans to the left just a bit. You can tell that the border is larger on the right side making everything a bit annoying. One other small issue I noticed was on the back of the box. It lists the playing time as 15-30′. Not sure how that one happened, but I’m sure it will be fixed before production as well. Imperfections aside, if you’re willing to look past these then you’ll find a overall nice looking game. While the overall theme doesn’t really translate all that well into the actual look and feel of the game, I still think it’s pretty easy to play with. The iconography isn’t that difficult to understand and most of the pieces I like. Hopefully these small issues will be addressed before the game goes into production and everything will end up much better looking and more thematic. For now, I’m ok with the game as is. As is normal with games from Joe Magic Games, the rulebook looks quite nice. There are plenty of pictures throughout the book. There are pictures of everything from how to set up the game to iconography on the action tiles, characters and mission cards. The rules aren’t that difficult to understand. As a matter of fact, the rulebook itself isn’t that long. The majority of the book comes from explaining the action tiles and how each symbol works. I think for the most part, the book looks good. However, there are a few places that were a bit of a head scratcher. One in particular came in explaining how the monk teaches skills. I had to reach out to the designer for some clarification on this one. I was assured that this will be addressed and fixed prior to the game’s production, so that hopefully there won’t be any further confusion. Apart from a few minor hiccups, I found that this rulebook was a lot better designed and the concepts flowed a little better. No need to jump around looking from page to page on how to do a particular task or action. That makes me happy. Overall the rules get a passing grade from me. I love a good fantasy game. I love how much fun it is to explore dungeons, fight horrible monsters and level up my character. I love finding lost treasure to equip my character with, as well as interacting with various npcs. I’ve definitely found that enjoyment through games like Descent and Masmorra. When I first saw this game, I wasn’t sure if it would create that same enjoyment that those other fantasy game had given me. I have to say though that this one surprised me. Granted this isn’t the next Gloomhaven or Mage Knight, but what it is, is a really entertaining fantasy style game. I mentioned earlier how that the bright colored hexes of the board really pull you out of the theme of the game. This is true, however when you really get into the game as you try moving around to fulfill the requirements from a mission card, you find that it doesn’t matter that much. Yes, I’d love to have resin miniatures and cardboard scenery with lots of wooden tokens and pieces to adorn the board with, but ultimately all that stuff doesn’t necessarily make a good game. As a matter of fact, there are plenty of games with all that stuff that are broken in more ways than one. This game scratches my fantasy itch without a ton of meaningless stuff getting in the way. This is one that you can sit down and play and actually enjoy what you’re doing. Granted the missions aren’t full of thematic story elements and there aren’t any real reason for why you’re characters are doing what they’re doing, still there are games that are just about completing a couple of main objectives that are tons of fun, like Scythe for instance. This game will have you trying to complete 3 honor tasks or score the most points if no one is able to complete 3 honor tasks before the last action on the board is flipped over. There are lots of ways to gain points, as you’ve no doubt discovered after reading the overview. At times, the game can seem like a race as players start completing honor tasks. At other times it can be more about gaining as many points as possible. In the end, it doesn’t really matter which option you choose to pursue. Either one can lead to victory. This game isn’t all that difficult. However younger players may find it a bit challenging. For this reason, I’d definitely recommend teens and older for this game. The game isn’t overly dripping with theme, but it gives you just enough of a fantasy feel to it to scratch that itch. Each player starts with the same action tiles as everyone else, so apart from character abilities, everyone starts off on an equal footing. I like how that a few decisions can quickly affect your character, either making things easier or taking you down for the count. Ultimately it’s all up to the players. I have to say that I’ve enjoyed this game. I think fans of fantasy games like Masmorra and Descent may find this one enjoyable. This is one that I would recommend giving a try. Like me, this one may just surprise you. Monumentum is a fantasy style game of performing tasks, completing missions and moving across the board fighting monsters. It can be a rather long game, depending on the number of players. Most game sessions last any where from an hour and 45 minutes to 2 and a half hours. I’m not normally one for games lasting longer than 2 hours max. The components for this game are kind of hit and miss. Most of the pieces look nice, but there are some that are quite poor in quality due to miscuts at the manufacturer. The theme doesn’t exactly come out in the look of the game, but the gameplay makes up for it. The rulebook also has some minor issues with rule changes that have since been addressed. The publisher assures me that these issues will fixed prior to production. The game itself is quite fun. While not originally a fan of all the bright colors on the board, once I played the game it made sense. I did enjoy this one more that I expected to. I like that players start out on basically equal footing with each one starting with the same set of action tiles. I also like that every time you play, the layout of the board changes with the randomness of the action tokens. This is one that I think fans of fantasy games like Masmorra and Descent might enjoy. I did find plenty of good things to like in the design of the game, despite the minor flaws in execution. As it is, this is one that I’d recommend giving a try. You may find that you enjoy it like I did. For more information about this and other great games, please check out Joe Magic Games at their site. Keep an eye out for the Kickstarter link coming soon. This entry was posted in Preview Reviews and tagged board, board games, card, card games, hanny, joe, joe magic games, magic, mark, mark hanny, monumentum. Bookmark the permalink.